Imran Ansari and Sajad Lone. 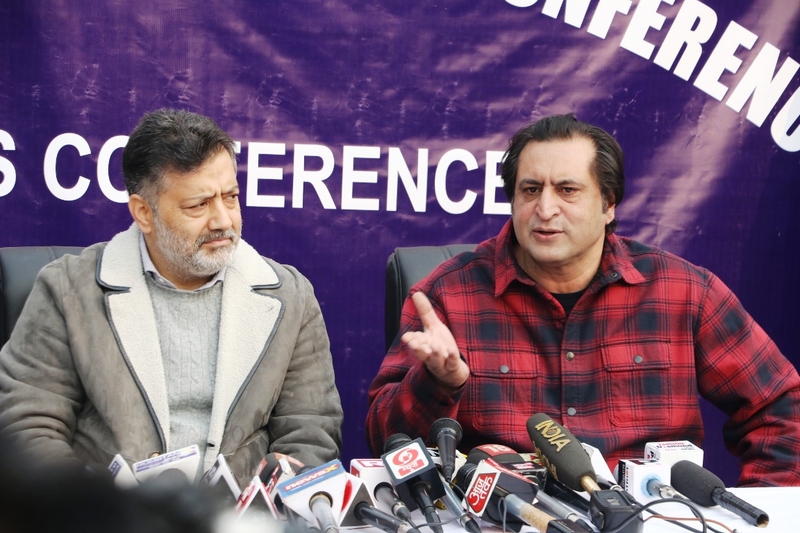 Peoples Conference has the unique distinction of being a Kashmir-centric political party divided into two factions with diametrically opposite ideologies. It is the legacy of Abdul Gani Lone, a politician par excellence. He switched from unionist to separatist politics after insurgency broke out in Kashmir in 1989. For 13 years, Lone Sr was a recognized face of separatist movement until he was killed by militants on May 21, 2002, on the sidelines of an event to commemorate the anniversary of Mirwaiz Muhammad Farooq. Lone had returned from a long stay in the US and Dubai before he was assassinated. During a seminar at an event at Ahdoos Hotel, just a day or two before his assassination, Lone declared that elections were not shajr-mam’nooah ( forbidden tree) though he did not give any indication of participation. Senior Lone’s sudden murder left the party bewildered. During his lifetime, his sons Bilal and Sajad and daughter Shabnum were not active in politics. In following years, they went in three different directions. Bilal settled in separatist politics and continues to be executive council members of the Hurriyat (m). Shabnum, a lawyer, unsuccessfully contested in assembly elections in 2014. She is often seen debating happenings in Kashmir on TV channels. Sajad, the youngest sibling is the proactive heir of his father’s political legacy though he declines to be a typecast dynast. During 17 years of his political journey, Sajad changed many goalposts before unambiguously settling in unionist camp. Weeks before the assembly poll bugle was blown in J&K in 2014, his meeting with Prime Minister Narendra Modi changed his fortunes. He called Modi as his elder brother. The Modi-effect gave his party two seats from Kupwara including his own, and he was subsequently inducted into the cabinet twice on BJP quota. A veteran journalist Tahir Mohiuddin in a recent TV debate said that unlike in mainland Kashmir, the alliance with BJP won’t have any negative impact on Sajad in his pocket borough. The BJP surrendered the ‘Hindu Chief Minister’ slogan when it favoured Sajad to stake a claim for the formation of government in November 2018. This faulty claim, staked to offset Mehbooba Mufti’s willingness to form a government with the support of NC and Congress, resulted into controversial dissolution of assembly. Sajad, however, stole a chance to bask in glory of becoming a claimant to the chief ministership. This is how his party has embarked on a new mission to contest from 87 assembly seats in the state. He has started considering himself a CM-probable at par with Mehbooba Mufti and Omar Abdullah. Sajad seems elated on his newest journey. Days after the dissolution of the assembly, Imran Reza Ansari, scion of a religio-political family deserted Peoples Democratic Party (PDP) to join him. Ansari was a discontented minister in Mehbooba’s cabinet often ruing his insignificant portfolios. He inherited his father Molvi Iftikhar Hussian Ansari’s political legacy after the latter’s death in 2014. Interestingly, like Sajad, Ansari also introduces himself as a crusader against dynasts. Sajad’s stock market value peaked in five months period starting from Mehbooba’s sacking up to the dissolution of the assembly. This period saw him in cohorts with BJP’s Ram Madhav, who handled the Modi government’s Kashmir’s chapter. Madhav tried his best to install a BJP-led government in the state, even for a week. His efforts did not come to fruition though. Sajad’s wavering value can be gauged from the fact that a day before the dissolution of the assembly, Muzaffar Hussain Beg sang paeans for him and threw hints of joining his party. After the dissolution, he avoided mentioning Sajad’s name and instead firmed up his association with the PDP. He was elevated to patron the party and his wife turned into a vocal campaigner. On the ground, pro-election political activity is not visible though the election is around the corner. Like in the past, the electioneering is expected to start from north Kashmir districts as defiance in south Kashmir region and indifference in central parts including Srinagar is obvious. He is building an aura by accepting deserters from the PDP and NC (read Junaid Mattu) into his party before going to interact with his prospective supporters. Maybe for his ardent supporters, PC’s alliance with BJP was a boon but he would face tough questions outside Handwara on this controversial alignment and his twisted political journey. His studied silence on potential threats to J&K’s special status did not go unnoticed. If he chooses to focus on development as his political agenda, his role as a minister, outside his constituency would be put under scrutiny. Sajad is believed to be writing a white paper on the state of unionist politics and its monopolization with a special focus on election rigging in 1987. It would be interesting to note what new factors he would discover during the course of his research and how that would help him mould the public opinion. In the meantime, his real elder brother Bilal Lone is understood to be mulling an idea to rechristen his faction of PC and pursue his separatist politics on a different name. This would be a gift to his younger sibling. Shabnum contested assembly elections in 2008 not in 2014 and in 2008 assembly elections Sajad lones Pc supported NC candidate mohd Ramzan Choudhary from Handwara constituency. Sajad lones political secretary resigned from the party before the dissolution of government.